Feel as if you have enjoyed a day at the spa after sleeping on the Beautyrest Spa Luxury Pillow. The SmartFlex knit fabric has a luxurious softness that moves freely while you sleep and includes ClearFresh odor-eliminating protection for everyday freshness. 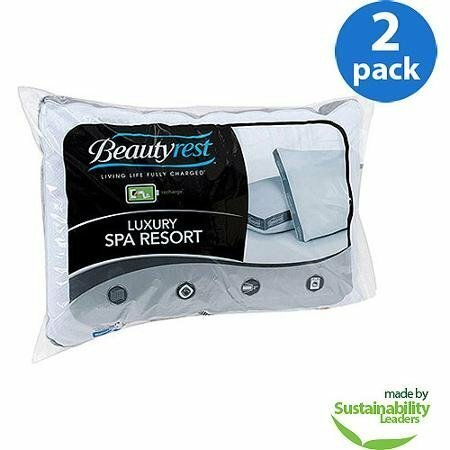 This resort Beautyrest pillow also includes a 2" gusset for superior head and neck support, so you can have a more comfortable night's sleep without mattress induced neck pains in the morning. Wake up and start your day feeling fresh and well rested.Treat yourself to a spa day every night with this Beautyrest Spa Luxury Pillow. If you have any questions about this product by Beautyrest, contact us by completing and submitting the form below. If you are looking for a specif part number, please include it with your message.